What’s happened to common sense? On the face of it, the one match suspension for a slow over-rate handed to Proteas captain, Faf du Plessis, after the second Test match against Pakistan in Cape Town is ridiculous. But is it really? Over-rates in Test cricket, and the punishment for failure to adhere to it, were introduced by the International Cricket Council (ICC) in the 1980’s. At the time the Windies were the kings of the cricket world. A huge part of their success was based on their fearsome four-pronged pace attack. In order to keep his bowlers fresh, captain Clive Lloyd (and his successors) slowed down the over-rate. When wickets started to tumble, the over-rate could go down to as few as 10 per hour. It was all a bit of gamesmanship but perfectly within the laws of cricket at the time. However, the feeling was that the opposition teams were being disadvantaged because on average they faced fewer overs than the Windies. As a result the ICC introduced a new law, setting an average over-rate of 15 per hour over the two innings of a Test match. So it has been ever since, with allowances made for inclement weather, drink breaks, fall of wickets, injuries, etc. With the advent of T20 cricket and a greater emphasis on generally speeding up the game to cope with current television and commercial demands, over-rates have taken on a completely different importance. The ICC match referees therefore police over-rates like hawks, and quite rightly so. For the most part, over-rates and the punishments that go with it (usually fines or match bans) have worked. Rarely do we see the old Windies’ tactics to keep the pacemen fresh or teams cynically slowing down play to force a draw. After the Newlands Test, the umpires formally charged Du Plessis for a slow over-rate and the ICC match referee, David Boon, suspended him for one Test match because the Proteas were one over short of the allotted target. 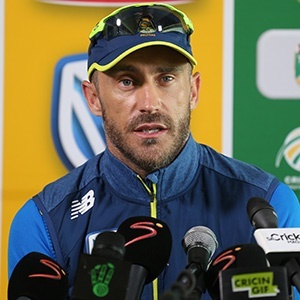 Last season Du Plessis was guilty of the exact same offence in a Test match against India, but escaped punishment because the match referee deemed it a “minor offence”. However, the rules also stipulate that another similar offence within 12 months results in an automatic one-test suspension. In the days since the sentence was passed, Boon has come in for some criticism. In my opinion, however, he cannot be blamed. He was only applying the laws. The crux of the matter appears to be that the match referee has no discretion in such a scenario. We are left with a situation where the laws of the game our out of kilter with reality and common sense has been chucked out the window. The Test was basically over in three days (forget about the 40 runs South Africa had to knock off on the fourth morning). The Proteas required only 256 of the scheduled 450 overs (i.e. 15 overs x 6 hours’ play per day x 5 days) to win. Needing just over 50% of the allotted overs to win, it could hardly have been disadvantageous to Pakistan that one measly over was lost over three days. Was any television station, commercial stakeholder or fan short-changed at any stage during the action-packed three days? I don’t think so. At no time during the Test match did Du Plessis (nor for that matter his Pakistan counterpart, Sarfraz Ahmed) deliberately try to slow down the over-rate.